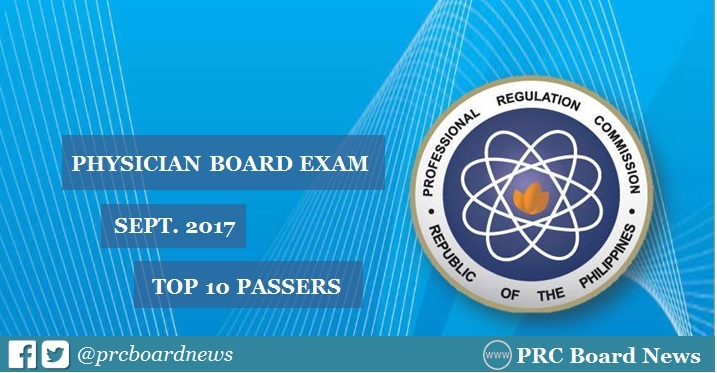 The September 2017 Physician board exam top 10 or topnotchers together with other results - list of passers, top performing schools and performance of schools are out online on Friday, September 22, 2017 or in 4 working days after the last day of exam. Vincent Edouard Anthony Retardo Gullas from University of Santo Tomas (UST) aced the board with 90.50%. Jan David Choa Monzon and Robert Carandang Rena both from De La Salle University (DLSU) - Health Sciences Institute got the second highest place with 90.08%. In the September 2016 Physician licensure exam, Jeri Charlotte Albano from University of Santo Tomas (UST) aced the board with 89.50%. It was followed by Edwin Mark Lim Chiong also from UST garnering 88.75% average grade. Kark Emmanuel Cueva Mercader from University of Perpetual Help System Dalta - Las Pinas topped the March 2017 Physician board exams, 88.58%. Alvin Lester Samson Villas, graduate of Our Lady of Fatima University - Valenzuela ranked second with 87.17%. Here's overview of topnotchers for Physician board exam in the past 2 years.